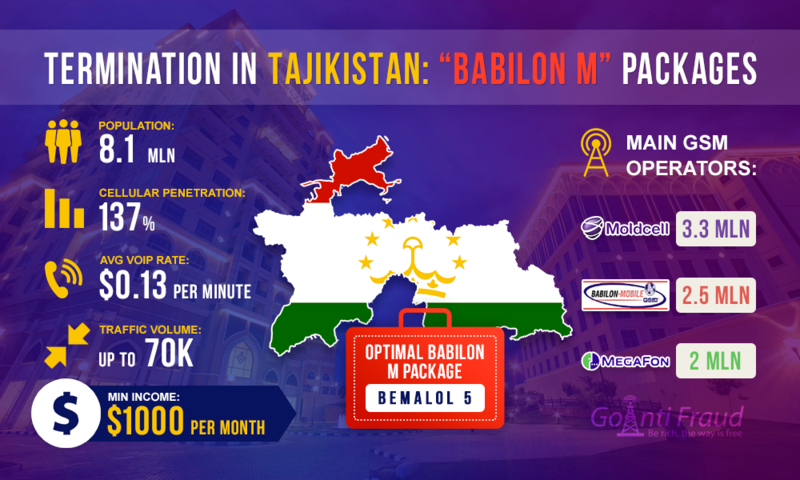 "Babylon M" is one of the largest GSM-operators in Tajikistan, which has a subscriber base of 3 million users, and covers 99% of the country. The company provides 7 prepaid unlimited packages for subscribers, which are "Mufid," "Bemalol 5", "Ҷavonon", "Makhsus", "Faol", and others. To connect, users must make an advance payment of $0.13, as well as the amount to cover communication services - from $0.51 to $2.04. All packages require the subscription fee for 1 or 10 days or a month. In terms of VoIP termination, GSM packages must provide cheap billing, excellent coverage across the country, and an opportunity for SIM-cards to operate as long as possible. From the viewpoint of business VoIP, "Bemalol 5" is the most suitable. Terminating for 4-5 days for a few hours, a minute will cost $0.0027. But the user must make an advance payment in the amount of $2.42, subject to extra charge of $0.64 every 10 days. This is an important point because if you fail to comply with the conditions, the tariff plan will be disabled. The second package that is suitable for the termination is "Mufid". It, like "Bemalol 5" requires a prepayment, but in the amount of $1.34. Payments include the connection to the network, advance payment for services, the initial total payment, and the subscription fee per day. The daily payment is $0.06. Terminating via this package, a minute of the conversation will cost as little as $0.0045. Terminators call the "Chavonon" package the best business VoIP solution. For it is important to make the initial payment of $6.25. The required monthly fee is $1.91 per month. When you use this tariff plan, a minute call will cost you $0.0070. By the way, 7 Babylon M" packages provide a comfortable and smooth communication within the network at affordable rates. In addition, the user is given an additional opportunity to connect to the wireless Internet. The cost of Voice Traffic Tajikistan from "Babylon M" is an average of $0.0930. Based on the above rates, the amount of profit for the termination of one minute will vary from $0.0903 to $0.086. Multiplying these data by the number of hours and days of operation of the equipment, it will amount to $1,000. And it's only for one channel. The multi-channel equipment that has from 4 to 32 ports is often used for a successful termination. To calculate the profit, you need to multiply this amount by the number of ports.